The highlight of last year’s inaugrual Sail-In Cinema, sponsored by the Toronto Port Authority, was a splashing, er, smashing success! It’s baaaack! The Toronto Port Authority’s Sail-In Cinema, Toronto’s most creative outdoor screening event, gracing the stretch of land – and water – beside Sugar Beach at Corus Quay, is back for its second year of nautical-themed movies screened under the stars and on the lake. 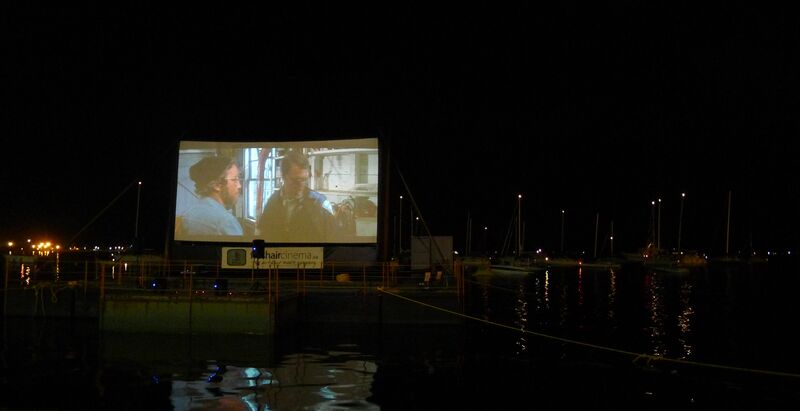 As I wrote last year, the Sail-In Cinema is one of my favourite outdoor screenings in the city. And that says a lot, since Toronto has enough FREE outdoor screenings for every night of the week and then some: take your pick, say, on Wednesdays between Harbourfront and TIFF in the Park, or on Sundays between the west-end’s Christie Pits Film Festival and the east-end’s Movies in the Park at Riverdale Park, or do Tuesday’s Cult Classics at Yonge-Dundas Square, Friday’s Movies Under the Stars at Downsview Park, or Saturday’s Backyard Cinema at Green Space on Church. But it’s the unique aspect of this waterfront-friendly film series that makes it a big fish in a big pond, um, lake. That’s because the inflatable double-sided screen (from Fresh Air Cinema) floats on Lake Ontario, so land lovers can watch from shore while those blessed with boats can sail up to the screen, tune into the audio via radio, and watch from the luxury of their deck! You read right! The Sail-In Cinema is special indeed! 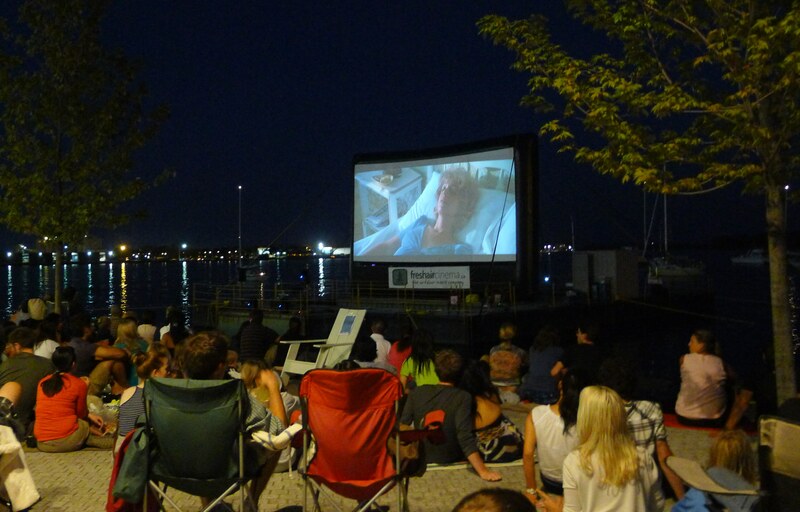 In 2011, Jaws was the big draw to Toronto’s Sail-In Cinema. Will it top 2012’s nautical-themed films too? Cast your vote till July 24! That’s tonight! Last year, the Friday night screening of Jaws was the huge draw (see photo above), with 20,000 Leagues Under the Sea and Finding Nemo attracting a smaller (and younger) set. This year, cinephiles have until tonight to cast their vote for the three flicks they want to catch this year. 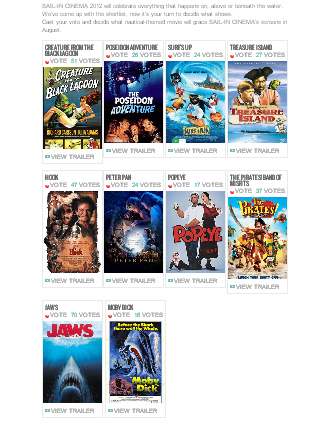 Jaws is leading the pack so far, but Creature from the Black Lagoon and Hook are close behind. 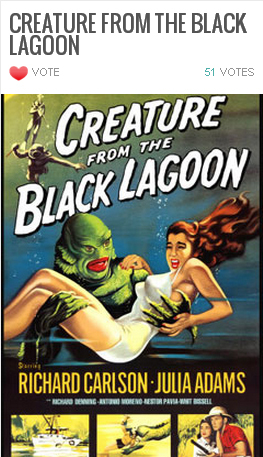 And really, who wouldn’t want to see Creature from the Black Lagoon while looking out onto the water, in the dark, under a blanket of stars? Cast your vote today! And then visit the site from July 25th to request your free tickets!